All transactions are safe and secure with a reliable history in online purchasing behind each of our associates. 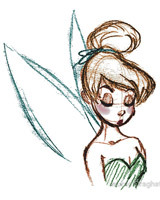 Buy the Sketch Tinkerbell t-shirt to own Peter Pan clothing and merchandise. This sketch style Peter Pan tee featuring Tink is available in a variety of styles and colors for men, women and children. You can have it any way you like it, so pick your favorite look. The sketch style perfectly breaths the whimsy of Pan's world into this piece of Tinkerbell clothing. Get this design or check out the other Peter Pan shirts. In addition to the Sketch Tinkerbell tee above, browse the Peter Pan Clothing Gallery for more apparel like men's and women's clothes, kids shirts or hoodies.